Our objective is to design a portfolio that helps you reach your goals without the normal volatility you would expect from the markets. We can help you setup and manage 401(k)’s, SEP’s, and Simple IRA plans. Most people already have savings, investments, and retirement funds, but they don’t have a plan. FIND OUT HOW we can help you save for retirement and protect your financial future. Business succession planning for small business owners. HELP PRESERVE YOUR ASSETS and pass them on to your heirs. We can help you manage your 401K AND INDIVIDUAL RETIREMENT ACCOUNTS. HOW MUCH INSURANCE do you need? We can help you analyze and find the appropriate types of insurance to fit your needs. Financial planning during divorce is stressful. We can help you make better informed decisions for your long term future. Contact us today, for a complimentary meeting. 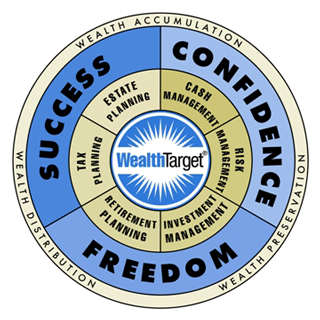 we can custom design a WealthTarget® Strategy to help meet your needs. We start by listening to you; your dreams, your goals, and your wealth planning needs. We work with you to lay out the framework and then prioritize what’s important to you. We then develop a financial and investment plan that fits your lifestyle. Our strategies were designed to help you gain confidence in your financial decisions which may give you freedom from unnecessary stress and can help move you closer towards your ultimate success. Your success is our goal.